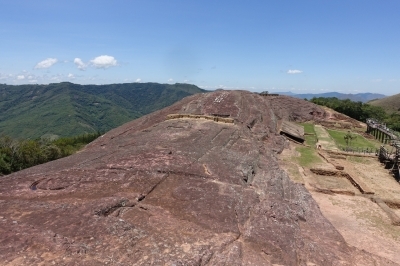 El Fuerte de Samaipata is a form of gigantic rock art full of religious symbolism, made by prehispanic cultures. The site consists of a rock shaped with ceremonial carvings. 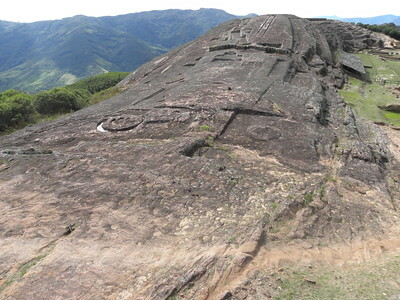 The natural sandstone hill measures 200x600m, and is completely sculpted with felines, snakes, birds and geometrical motifs with a magical and religious character. Below it lies a former provincial capital of the Inca, including a central plaza, public buildings, houses and agricultural terraces. The site dates mainly from the 14th -16th centuries when the Inca gave it its monumental character, though the location was already used by other (Amazonic) cultures. Only a link with the Mojocoya (ca. 300 AD) has been established so far. The site was known and used for its strategic location by the Inca and the Spanish, hence its name "El Fuerte" (The Fortress). At 1920m above sea level in the sub-Andean, it was an intermediairy stopping point between the Andean highlands and the lower areas. There have been various alternative explanations about the use of the site, varying from a place for washing gold to a take off- and landing ramp for ancient spacecraft. How often have you had a WHS all to yourself? I can think of only a few times when it has happened to me (the last time was in Fontainebleau, of all places). Well, on the Tuesday morning that I arrived on foot at the entrance of El Fuerte, I was the first to sign the visitor book for the day. It was 10.15 by then already. The days before hadn't brought many visitors either: about 5-10 a day on average. The friendly lady in charge, who had seen me walking up from afar, sold me a ticket for 50 bolivianos (5 EUR), gave me a map and sent me off on the predescribed circuit of the site. The track is 2km long, and involves quite some climbing until you get to the very top of the hill. There they've made two viewing platforms where you can admire the sculptures from above. It's really a weird slab of rock. I can see why imaginative researchers have come up with the hypothesis that the rock was used as a kind of airfield. It looks just like that little take off- and landing strip at Lukla in Nepal! Just a short stretch of flat road before diving off into an unsure flight amidst the mountains. The map that is included with the entrance ticket shows the position of the most prominent sculptures, a bit like the map they give you in Nazca. The motifs here are even more difficult to distinguish than those at the Nazca Lines - a lot of the rock sculptures have eroded. The two felines I really could not see. The channels and the geometric pools are the most clear ones. The track then leads you down to the former Inca town. Not much more is left of it than walls of groups of buildings. It gets more interesting at the end again, where you're allowed close to the rock to observe the Five Niches, an Inca temple cut out of the rock. There may be not a lot left to see here, but the visit in general was very worthwhile. That's mostly because of the wonderful natural surroundings of the site. It is located in the Amboro National Park, with great mountain vistas and abundant birdlife. I think I even spotted a Condor (I saw one bird with a giant wingspan). I walked both ways to and from the site from Samaipata, 10km each way, which I can really recommend when you want to enjoy the natural beauty of this place. The site itself is well-cared for, even with so few visitors. There's a kiosk to buy drinks and snacks, and the circuit is partly made out of boardwalks. On my last day in Bolivia I ventured to El Fuerte de Samaipata. El Fuerte is a pre Incan / Incan ruin on a hilltop near the town of Samaipata. The inhabitants carved several stone sculptures into the stone. Thanks to good sign posting and trails you can even spot some of them. There is probably less to see here than in the other pre Colombian ruin of Bolivia, Tiwanaku. But the setting in the lush mountains as well as the presentation with a well crafted trail and viewing points, made it so that I enjoyed this more. My hotel in Santa Cruz was a bit to the South West of the city center. As such it was located within walking distance of the minibus station for Samaipata. It's near the stadium. The road takes you to the outer edges of the Andes mountains along a river canyon, quite a site to behold. At the time the road was in repairs and huge swaths in pretty terrible state as a consequence, so the ride took longer than anticipated (3h or so). The simplest option is to get off at Samaipata and get a return cab to the site from there. In my case, I let the driver drop me off at the crossroad to the site in order to walk. It's 6km, 2h steep walk uphill and I do not recommend that. I also had to walk all the way back as I couldn't get a cab at the site itself. At least you can get food and drinks at the site and along the way you get a few nice views. In order to return to Santa Cruz I had to go back to Samaipata. All minibusses passing at the crossroads will be full and unable to pick you up. Lucky me, a local gave me a ride to town. Visited November 2014. Easy if you are in Samaipata town (recommended to stay a bit longer). The easiest way to get to El Fuerte is by foot (some 9 km from Samaipata town). If bad weather or lack of time the most economic way is to take a moto-taxi from just outside the mercado (cost for one way should be 20 B per person - moto-taxi takes only one person at a time), car-taxi for a full trip will want more, there is no other public transport there (well of course there is a possibility to arrange a trip from local agency - costs more ....). Joint ticket for foreigners (50 B per person, a little bit too much as for Bolivian standards) entitles to visit a site of El Fuerte and a local museum in Samaipata town (two halls, some plans, ceramics). As mentioned El Fuerte is located 9 km from the centre of Samaipata (direction of Santa Cruz), the road is just being paved (2/3 of the job is now done) so next year they will surely have excellent road there. For the whole site 3-4 hours should be enough to see - take some water with you. I now belief the marker on El Fuerte de Samaipata (El Cascabel) is marking the parallel heliacal rise of our brightest planets Venus and Jupiter on August 20 in the year 1066 AD instead of the parallel heliacal rise of Regulus and a planet. These two planets, as two bright celestial eyes, could be seen almost always in a year of Halley's Comet return. Ik zag dat je gewoon uit Nederland kwam dus ik doe het dan ook maar in het Nederlands. Ik ben samen met mijn vriendin in november 2002 in Fuerte de Samaipata geweest. Het gebied rondom de tempel wordt (werd) goed onderhouden en er zijn overal loopbruggen en uitzicht torens bij geplaatst. Het is wel een heel gedoe om een kaartje te kopen om het complex op te komen maar dit lukt uiteindelijk wel. Recently I have seen photographs of El Fuerte after restauration by UNESCO. Great work! Me and my wife visited El Fuerte in 1998. In the past years I have done some research on the meaning of 'El Cascabel':one of El Fuerte's most significant features. The 263 diamantshaped curves on El Cascabel and the view direction of the two parallel shafts of El Cascabel ( azimuth 71"0')show the importance of Venus, the morningstar. It was Garcilaso de la Vega in his ancient chronicles of Peru who mentioned this temple for the first time. In his description he speaks about he stone images of two condors (cunturs) that could be found on this hill. One cuntur was depicted in flight 'as to swoop on it's pray' and one cuntur with 'it's back turned to the spectator as in shame'. Both images still can be seen on El Fuerte although they haven't been published before and are also unknown by UNESCO. Besides that one particular spot one El Fuerte should be protected very well because this spot marks the (unknown and not-published)images of the mythical Manco Ccapac and Mama Occlo and also the images of two Llamaheads (offers?). I hope UNESCO will take care of these paintings now. I will reveal these places in personal communication with UNESCO. 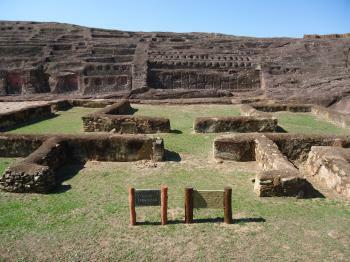 Destroyed during invasion: Wiki: "Guarani warriors conquered the plains and valleys of Santa Cruz and destroyed Samaipata." Irrigation and drainage: ICOMOS: "There is an impressive series of at least nine cultivation terraces on the east and south of the rock. They are interconnected by means of stone steps and have a sophisticated system for drainage."